If These Walls Could Talk! We are pleased to offer a modest food service, open for the season May 20, 2019 to September 2, 2019. We are working on a new menu for 2019, check back soon. We can now process debit and credit cards at our seasonal food service. You are welcome to enjoy your snacks as a picnic in the Edwardian Gardens or you can pre-order one of our picnic baskets (please order 1 week in advance, see order form below). Plus, you will also be able to purchase some great reading material. We have two books by author Judith Silverthorne; Ghosts of Government House and Ghost in the Garden. 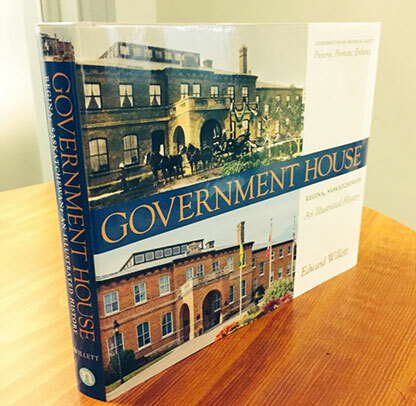 Additionally, Government House: An Illustrated History, created by the Government House Historical Society, is a wonderful coffee table book for any home. These are available year round. The basket and a Saskatchewan tartan blanket will be available for your use. If you wish to pay by cash or debit, your credit card number will be used for deposit only. Your credit card will only be charged if cancellation is not given 48 hours prior to pickup. © 2019 Government House Saskatchewan - A branch of the Provincial Capital Commission. All rights reserved.